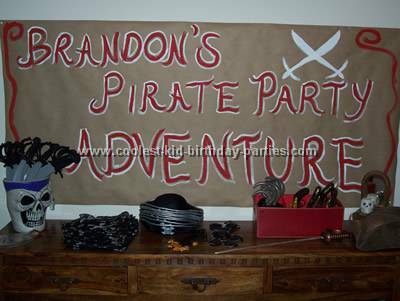 For my son’s 5th birthday party Brandon decided he wanted to have a pirate theme party. Being that Pirates of the Caribbean is his favorite movie, he dressed up like Captain Jack Sparrow. We found the accessories at Wal-Mart. He wore black pants from another pirate costume he had and a white tee shirt. 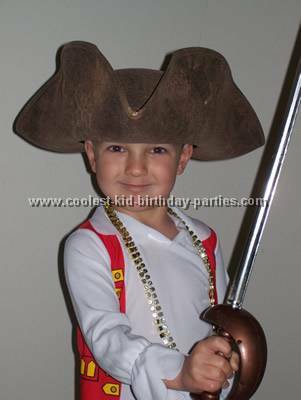 The accessories consisted of a belt, rings, head band, compass and a leather suede pirate hat I bought during Halloween. In order to make his face look muggy, I used some make up. So, we sent out “messages in a bottle” invitations. We put sand and shells inside the bottle. Then the invite was tea stained with burnt edges rolled up and tied with twine then corked. A picture of Brandon dressed as a pirate was at the top. 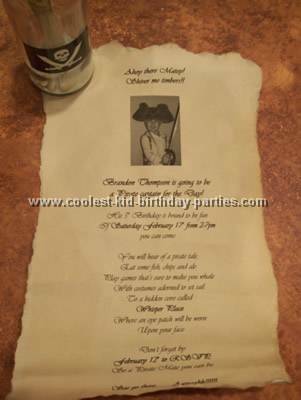 I also used font that was pirate-y looking and the wording was a poem describing the activities, food and dress up for a pirate theme party. As the guests arrived they started at the sign in table I made a scroll out of brown shipping paper and a paper towel tube decorated with pirates and coins. The kids loved signing their names and leaving a message to Brandon. The kids then went to get dressed up with hats, bandanas, eye patches, toy guns and swords. Next was the tattoo table and make up table. So, all the kids loved putting tattoos on and making their faces look muggy. 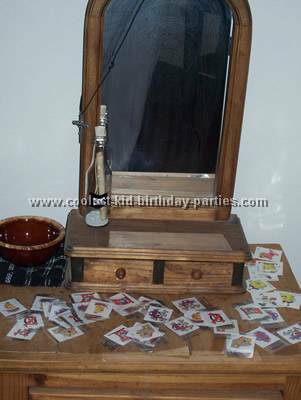 The mirror came in handy, kids love to look at themselves after they get all dressed up. Afterwards I took individual pics of Brandon and his friends. During the pirate theme party my husband printed them out and placed in already hand made thank you cards, these were then handed out as our guests left. While waiting for all the guests to arrive the kids played in a jumping castle. To fit the jumper into the pirate theme party we rented a Madagascar one and made a sign saying “Madagascar Island, Enter at your own Risk”. Once everyone arrived all the kids gathered in the living room for a pirate tale and questionnaire. Each kid that got a question right received a secret prize from the “booty box”. Next was on to the games “Pin the pirate on the treasure” we made ourselves out of brown shipping paper and colored a treasure map on. “Walk the Plank” all the kids loved. We put together with a 4X6 plant board placed on blocks. At the end the kids had to jump into a pool with ankle deep water filled with floating sea creatures and sand. “Treasure Hunt” was challenging. We formed 2 teams because we had 22 kids total. The teams had to race to find the treasure. Eight clues were placed all over the yard. Each clue lead to the next until they reached the last clue which lead them to the treasure. The treasure was the kids “goody bags”. Brown bags were filled with candy coins, beads, jewels, pirate pencil and eraser pirate color book and pirate crayons, pirate bubbles & pirate finger puppets. Each guests name was printed out and used as a seal to close the bags. The cake for the pirate theme party was as idea I got from this website. A treasure island with waterfall and a pirate ship crashing into the island. Blue died coconut to resemble the ocean was sprinkled all around the cake and ship. I also made a little row boat out of a mini loaf. The island and pirate ship was decorated with characters from the Pirate of Caribbean movie, Jack, Will, Miss Swan and some of the other pirates from the movie. 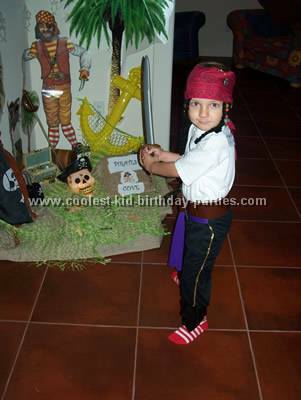 The sails on the ship read “Happy 5th Birthday” “Cap’n Brandon Sparrow”. In addition, a menu was printed out and placed on the end of the buffet table: fish-n-chips or chicken planks-n-chips, lava cheese and chips, carrots & celery fruit on skewer sticks with coconut sushi and sharks blood punch made of sprite and red punch ice cubes. Decorations created a pirate-y ambiance. Jolly Roger flags lined our 80 ft driveway. We painted about 25 black signs with red and white pirate wording and skulls and placed them all over the yard and entrance. The buffet table and cake table we decorated with palm trees around pirates as a backdrop and a sign that read “Beware of Pirates”. 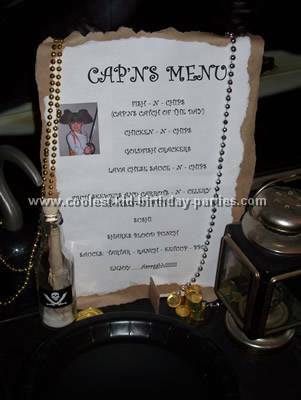 The menu was at the start of the buffet table and decorated with the pic from Brandons invite, an old black lamp, beads, gold coins and a pirate hook. Beads and coins were placed all over the tables. 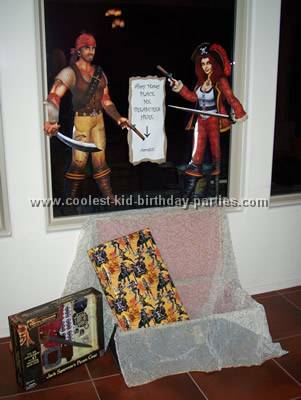 A treasure chest was decorated and a sign above read “Place me Treasures Here” for a cool place to place gifts. Also, corners of the house were turned into pirate coves: paper pirates, palm trees, fish nets, sea shells, treasure chests with jewels, sea creatures, hooks, anchors and wheels were all displayed. The kids table was decorated with pirate of Caribbean theme, a treasure chest filled with beads, jewels, gold coins and candies. I rented tables from a party supply place so all the kids could eat together. 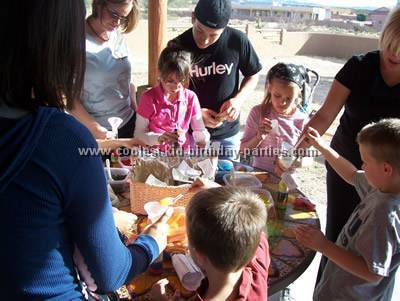 In addition, the kids did a sand activity purchased online. It came with 10 colors of sand bottles, spoons and funnels. So the kids created colorful designs in woozy bottles. 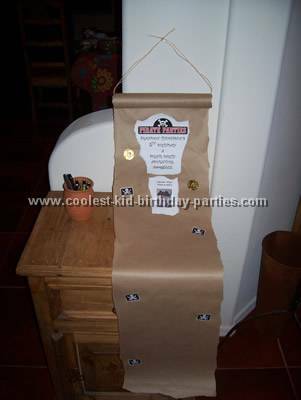 We had made labels that were tied around the top thanking them for coming to Brandon’s pirate party adventure. 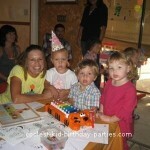 Everyone loved this pirate theme party and it was fairly cheap too. Consequently, Brandon’s 5th birthday party was a success. He is already talking about his 6th birthday party. 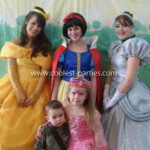 This website was so helpful in making Brandon’s pirate party so creative and fun that I bet I will start here for ideas. It was lots of work, lots of money but the smile on my son’s face that day….PRICELESS!